Anna MacAlpine’s Polonius and Children ran as part of Sage Theatre’s 2015 Ignite! Festival. 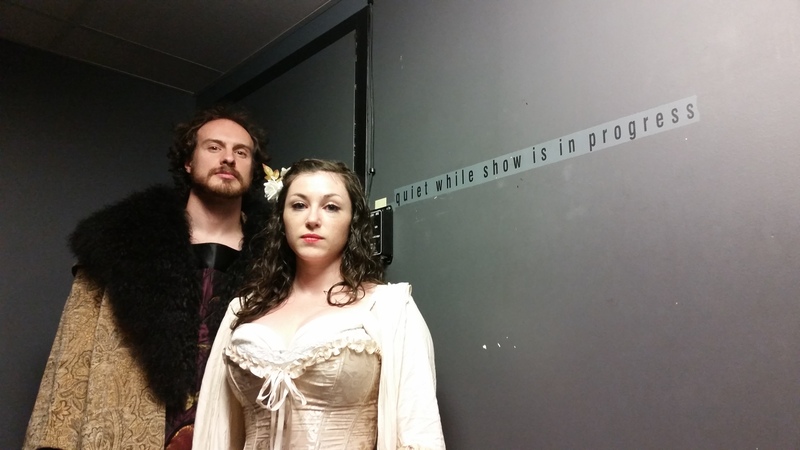 Pictured: John McIver (Polonius) and Brianna Johnston (Ophelia). Imaged provided by Sage Theatre. One hopes that the dead find peace in the afterlife; some respite from their mortal pains. That is, after all, the promise of death: an ultimate end. But what if, what if the dead are no different than those who roam the earth, burdened by secrets and regret? Anna MacAlpine’s Polonius and His Children imagines a reunion between the titular character (John McIver) and his children – Ophelia (Brianna Johnston) and Laertes (Greg Wilson) – in the afterlife. The reunion is, unfortunately, not a happy one as the characters, the very same from William Shakespeare’s Hamlet, meet only to confront each other on unresolved issues. Among them is an unseen, mischievous spirit of the void (Amy Sawka) who narrates the drama. Ophelia is the first to meet Polonius. Upon seeing her soaked dress, Polonius, whose stab wounds have not healed, asks who drowned her. Ophelia’s response is, very fortunately, interrupted by Laertes’ entrance into the void. Quickly, Ophelia and Laertes find that their father, despite an eternity for reflection, is the same old fool he was when they were alive. While Polonius’ children both assert themselves against their father, it is Ophelia who struggles most to have her independence recognized. Even in this hellish landscape, Polonius and Laertes continue to dominate Ophelia’s life. They speak so much over Ophelia that she is never given the chance to explain herself. In fact, MacAlpine argues, Ophelia has never been allowed to explain herself. Here, MacAlpine examines through a feminist lens the works of art inspired by Ophelia’s death. MacAlpine does so by envisioning what Ophelia would say about the artists who, over the years, have portrayed her as a virginal beauty who died a ‘beautiful death’. It was not beautiful, Ophelia says, it was painful. And why is there, she asks, such importance placed on virginity? How does that make a death beautiful in any way? Ophelia’s soliloquy is replete with anger, frustration at the narratives imposed upon her exploited body. Along the way, MacAlpine infuses humour into the play in the way of clever references to the source material. The playwright, too, has fun with the characters whom she has written with her own flavour. Although, while the humour works in some areas, the humour feels out of place and at odds with the play’s overall brooding tone. In terms of performances, the ensemble is strong. Sawka is very physical and light on her feet. Her playfulness never upstages the main action. McIver plays Polonius brilliantly. McIver’s mannerisms signal a Polonius who has lived one life too many; an old man unable to find rest. Johnston and Wilson do well as Ophelia and Laertes. Wilson’s casual demeanor mixed with his solid delivery attracts big laughs from the audience. Johnston nails the soliloquy given to her, she is truly in synch with her character. MacAlpine’s Polonius and His Children is a smart, poignant drama that intrigues with its troubled characters and urgent themes. Anna MacAlpine’s Polonius and His Children was presented by Sage Theatre’s 2015 Ignite! Festival. The festival ran June 18-20 at The Studio inside Vertigo Theatre.